Day 22 of the Heapnose Perfume Diary. 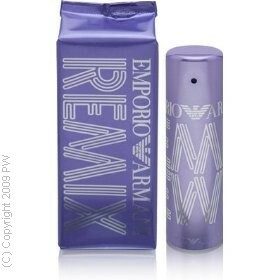 Today I’m wearing She Remix by Emporio Armani. Bad Perfumes fall into two categories. The superficial, tacky confections of the high street and b-list celebrity “designers”; and the insipid, listless, watery spritzes of the “recessionista” parfumeur – which, once sprayed, vanish like a fart on the breeze. Rarely (if ever) does a fragrance manage to fall into both categories. Until there was Remix. In what can only be described as an acrobatic display of awfulness, Emporio Armani She Remix successfully straddles both camps – managing to be at the one time, both utterly offensive and entirely devoid of any discernible scent in one graceless swoop. The talent, one can presume, must be in the timing. A quick hit of cheap, fruity, sweets and then…gone. On balance, I think the longevity issue pisses me off more than the sub-standard scent. Emporio Armani was conceived as the affordable alternative to Giorgio…you don’t go to McDonald’s expecting Cordon Bleu (unless you happen to be my ex-history teacher Miss P, who was actually overheard ordering “a scone and a nice cup of tea” at the drive thru. But that’s an aside.) But you do expect something; Some degree of satisfaction, some semblance of a fair exchange for the old dollar. Very few things hack me off more than a perfume which won’t stay put. It’s like buying a DVD boxset and only being allowed to watch the first disk. And Emporio Armani does it time and time again. I’ve worn Emporio Armani She. I’ve worn Emporio Armani She Night. I’ve worn Emporio Armani She White. And now I’m wearing Emporio Armani She Remix. That’s a a hundred odd quid I’ve spent on air and water. I could have bought a bottle of Tom Ford Tobacco Vanille with that money and still had a tenner left over to see StreetDance the movie. In 3-D. With the proper glasses. I could have even had a bag of Haribo. Or maybe a McDonald’s scone and a nice cup of tea at the drive-thru. What a colossal waste of a life. It must be that Megan Fox. And the nice tin bottles. Bewitching bastards, both. Hey, been enjoying the posts despite knowing nothing about perfume. Are you, you know, going to the true north strong and free? If so, when? Drop lines etc. We stand on guard for thee, you might say.